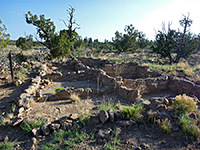 The short (1.1 miles), level Tyuonyi Overlook Trail leads to a viewpoint at the tip of a narrow promontory on the rim of Frijoles Canyon, giving a good elevated panorama of the main ruins site on the valley floor (Tyuonyi) though not of the nearby cliff dwellings as they lie out of sight, in alcoves. 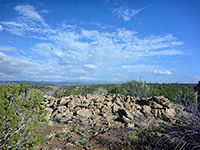 The vista extends several miles up and down the canyon, across to the surrounding mountains and the vast backcountry of the national monument, to the south. En route are several small ancient sites and a selection of desert plants, as the plateau is quite open and exposed, hot in summer, and generally too arid for many trees to grow. 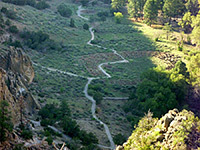 Map of Bandelier National Monument. Parking for the hike is shared with the Frey Trail, beside a shuttlebus stop on the spur road to the national monument campground. 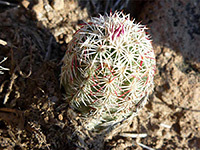 The path starts northwestwards, leading towards a grove of ponderosa pines near the campground amphitheater, then forks south, traversing level, rocky land bearing limited vegetation including scattered pinyon and juniper trees, banana yucca, tree cholla and the occasional specimen of echinocereus viridiflorus, a rare cactus species. 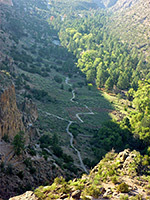 Two junctions are passed on the right, with the start and end points of an optional 0.7 mile loop, which visits an upstream section of the canyon rim quite near Alcove House. The first of two ancient sites along the main trail is the ruin of a rectangular six-room dwelling, now consisting of wall remnants just a couple of feet high. 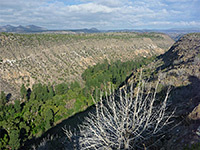 Soon after this a tributary ravine starts to form on the left, while the main valley of Frijoles Canyon comes close to the right - wooded along the streambed but rocky on the far side, where it is crossed by the backcountry Long Trail. 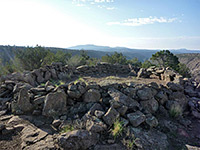 The second ruin is a circular stone structure, possibly a kiva, again just a few rows high. The path ends soon after at a viewpoint 400 feet above Tyuonyi and a quarter of a mile distant; the scene is best photographed in the afternoon when the sun is behind the overlook. Tyuonyi was once home to 600 people, with over 400 rooms on two storeys, and even today the site is very impressive.